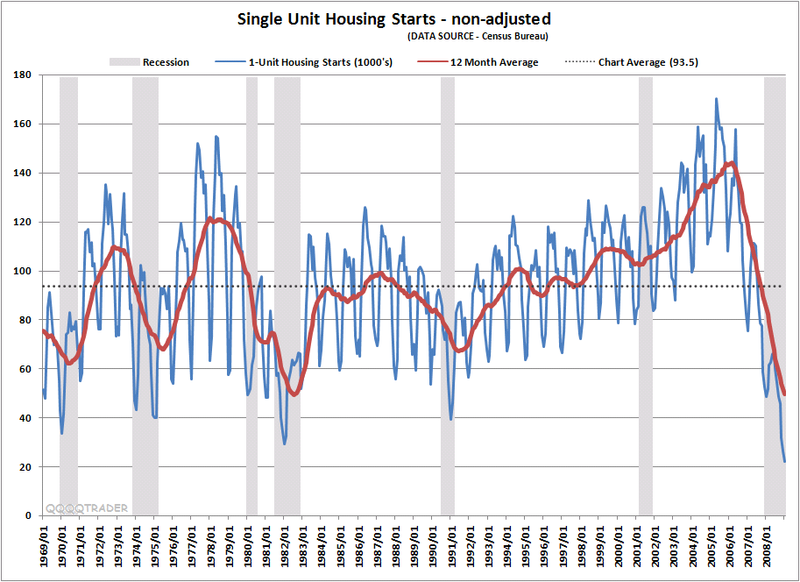 I’ve been meaning to get to this: Housing starts freefell earlier this week, plummeting 16.8% month-over-month to an annualized rate of 466K units.Multi-family units were down 28% to a 16-year low at 119K; Single-family starts were down 12% M/M to a new historic low of 347K. This marks the third straight month of new lows in single-family construction. Building is now running below underlying demand of ~500K/month, but the sector is still plagued with a significant inventory overhang of +1 million units. Of course, ongoing layoffs, stagnant incomes, and an ongoing recession does not bode well for Home Builders over the next 18 months. There may be a few short term trades here and there — but they are just trades.